Managing in the Media has been devised for a broad audience. It is based upon the perceived need for a text that amalgamates cultural theories, film and television analysis, management theories and media production practice into one volume. There are many books on film and cultural studies. Similarly, there are copious numbers of texts written on management. To date little has been written that analyses the management of the audiovisual industry set against the backdrop of the cultural and economic environment within which the media manager operates. Managing in the Media is divided into three sections that take the reader from the global to the specific, from the strategic to the tactical. Each chapter discusses specific topics that can be read in isolation yet contribute to the theme within each part. Taken as a whole, the book provides the potential professional media manager and current practising media manager with a framework of issues that will give them an awareness of the range of knowledge needed by the successful media manager. This book does not try to be a manual to success. The media industry is awash with successful individuals none of whom needed textbooks to set them on their chosen career paths. Yet these exceptional people prove the rule; that in the main, most media practitioners would benefit from some additional support and guidance. The aim of this book is to present to them some of the management issues that have, or will have, an impact upon their working careers. "I feel this book is well thought out, pertinent to its audience and fulfils its objectives. It would have saved me many a sleepless night and fortified me with a strength to 'go forward' that in-depth knowledge always supplies. I have no hesitation in suggesting that those who manage, or who aspire towards management regard it as a textbook that should be on their shelf." Marian Cumpstey, Consultant Educational Technologist and Editor of ScreenSeen. 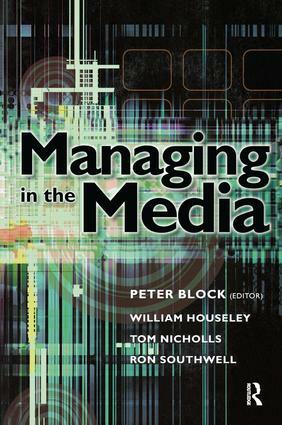 "This book does and important service in providing a one-volume textbook for those teaching/studying media management. Instructors and practitioners will find this book a comprehensive resource for practical and detailed information."